Well it took two days, but we have attracted another two members to ‘The Good Tittie Team’, and a generous donation from Len and Barb (BT’s parents) got Jenni over the line and she has now raised $2000 and is the second member of the team who has officially qualified to walk. It is quite fitting that the donation came from Barb, as she is one of the people we are all walking for. Hence, the dodgy hodgy chemo cuts 11 and 12 will be revealed after a bit of housekeeping. The Good Tittie Team tally now stands at a staggering $9551 with generous donations continuing to trickle in, and we have 15 members in our team!! All this, in just one week. 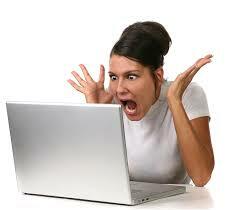 This is what I would look like if I had hair and was looking at ‘The Good Tittie Team’ tally. And Sunday’s top 10. Not much movement over the weekend. AND, ‘The Good Tittie Team’, despite having been in existence for only one week, is 14th on the tally of top fundraising teams. This is partly because we are such a large team but it’s still an amazing feat and amazing that we have attracted so much talent, including interstate talent! But don’t become complacent. 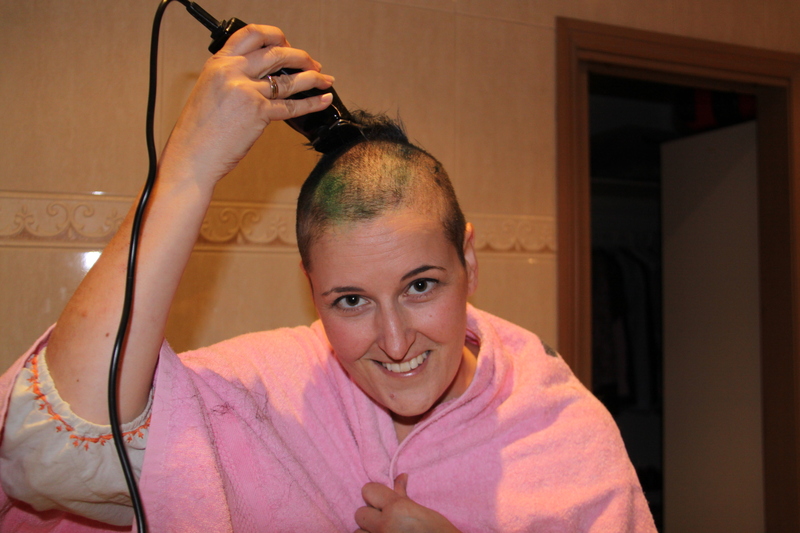 Keep donating please!! Every dollar counts so everyone out there who hasn’t donated yet, can you spare $10? If you can, donate now please! Charismatic Cousin Chris. Son of Uncle Noof (former fav uncle). Uncle Noof is the one who has chosen lawn bowls over walking with his niece with cancer and now has two of his three children stepping up. No pressure Cheyne. 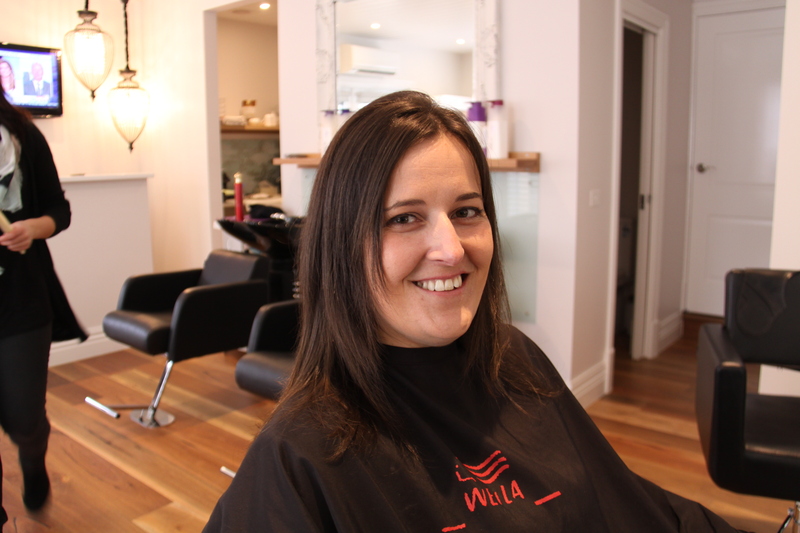 I was absolutely “shocked” when I found out Chris had joined the team, and that’s not just because he is an electrician (thank you Sonya for that joke). Chris was hoping to be the first male in the team but by his own admission, being male, he got sidetracked by something irrelevant. Hence, he will have to be content with the title of the youngest male in the team and, according to him, the funniest. Chris is ambitious, or delusional, and has set his fundraising goal at $1,000,000. Since he joined the team, we went from having achieved 25% of our target to achieving only 1%. Hmmmmm. The legendary long lost friend, Lee Neave. I wish I could say more about Lee but I haven’t seen her for about 27 years! Lee, Lisey and I all went to primary school together so I am pretty ecstatic that she has joined the team. Lisey and I were texting today and reminiscing about our primary school nicknames. We have no idea how we earnt them but Lee was Fozzy Bear, I was snake and Lisey was Ozzie Ostrich. Kermit, if you’re out there, come and join our team!! Roles are being filled in the team. Lisey and I are co-captains, Jenni is self appointed uniform co-ordinator and Unca Russ (the Godfather), being a sign writer, is the logo designer. 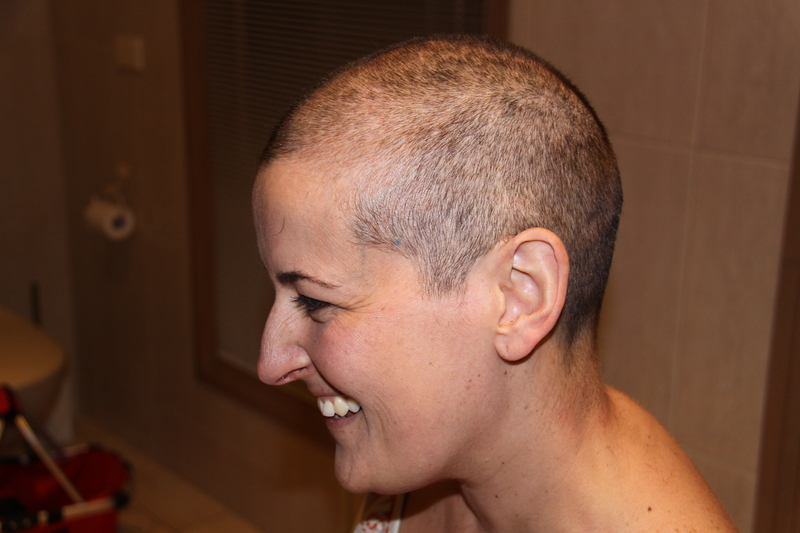 Well, here it is, Dodgy Hodgy Chemo Cut Number 11; the completely shaved head. Even I got involved with the shaving for this one. Ta da! The skin head. A side on view just to prove it’s all gone. 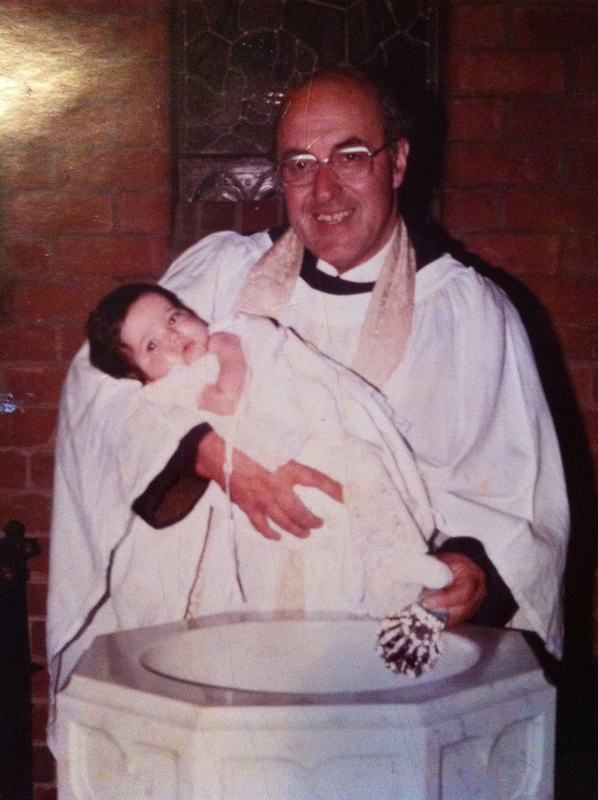 I haven’t had so little hair since I was a foetus! I was born with more hair than this! 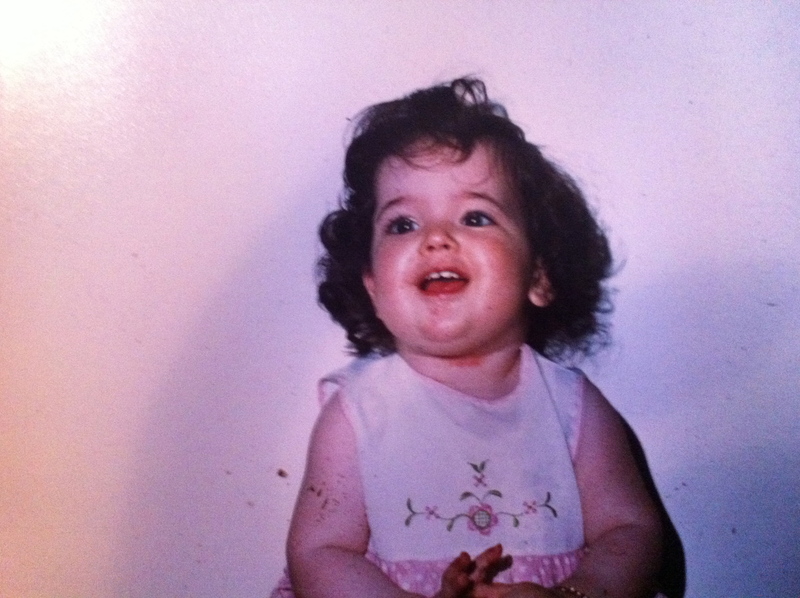 This is me at 3 months of age. And at 10 months of age. Yep, I think I’m a wog. A fairly substantial change! I actually think I like the pic with no hair better. 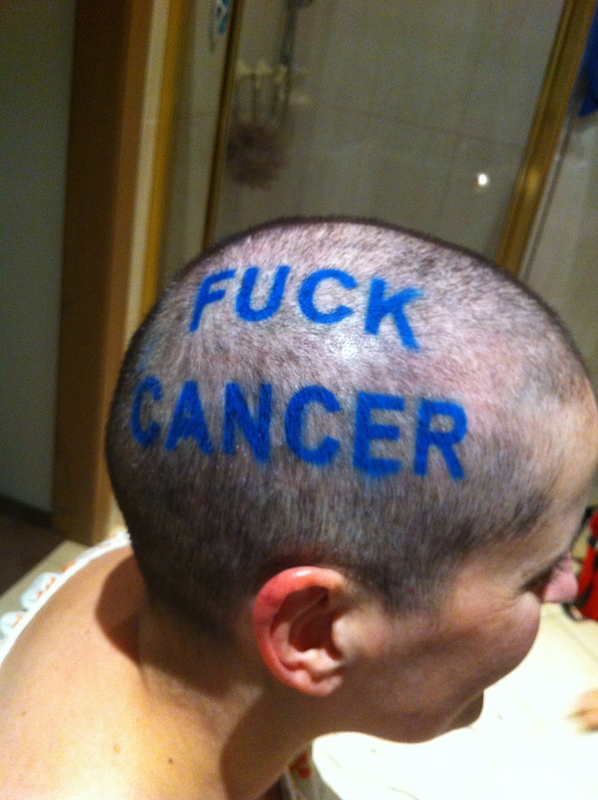 Dodgy Hodgy Chemo Cut Number 12 is my personal favourite. 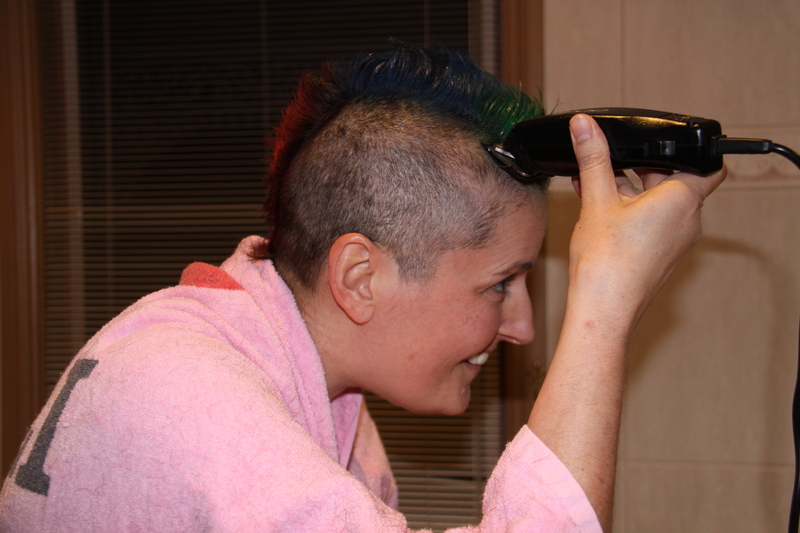 It’s not really another cut, I mean, what more can you do with a shaved head? It’s more of a statement. Here it is. A picture says 1000 words……or maybe only two. With the supportive fav sister. 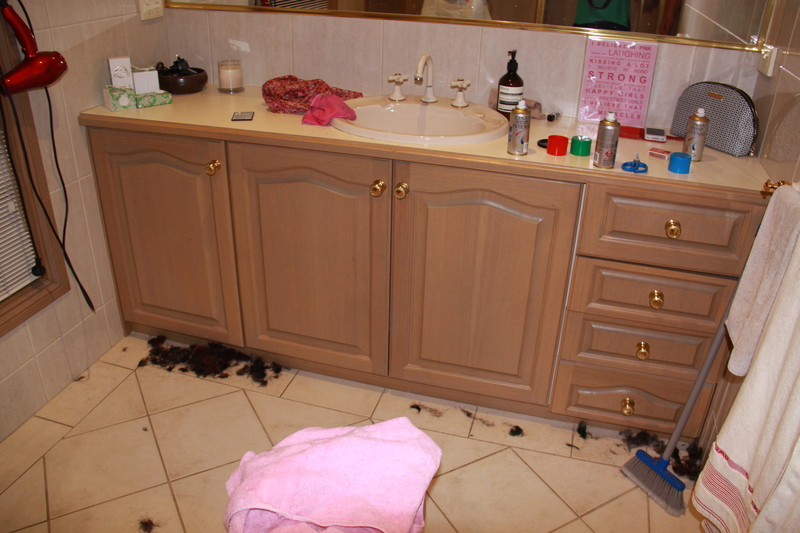 I think the part of all this hair shaving that was the most fun for me was making such a mess in Jenni’s bathroom! If you don’t know, both Jenni and BT are clean freaks. BT even makes his kids tap their feet before they get in the car so they don’t carry dirt in. Jenni’s bathroom after the shaving. Apparently she left it like this for three days! If you’re wondering how we got such perfect writing on my head, wonder no more. I will tell you. BT has a sticker business, as anyone who lives within a 100 km radius of him will know, as you would have woken up one morning to find a sticker on your car….or motorbike….or caravan….or lawnmower. For my head, BT printed a sticker and we simply removed the letters and used the surround as a stencil. Pretty good hey? You can even get this sticker on your car. 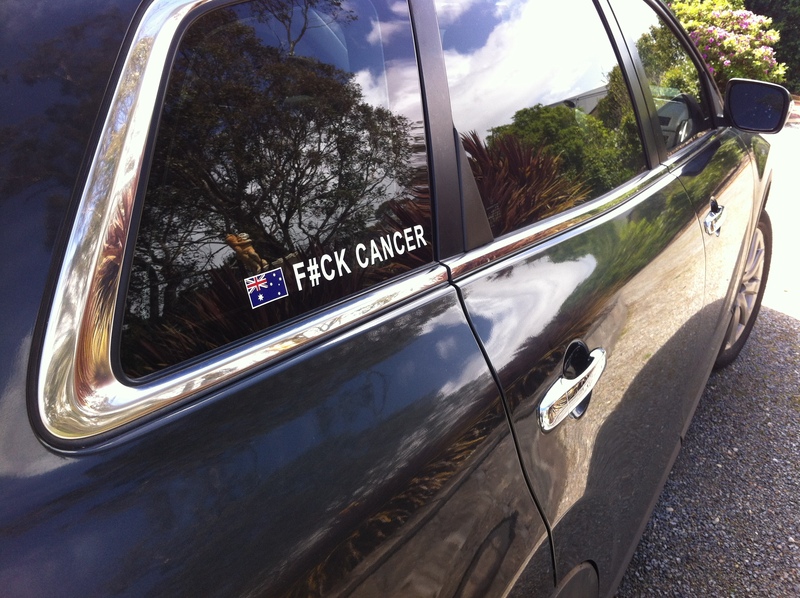 I reckon these stickers could take off in the cancer world. Not the purpose BT intended them for, but I don’t think he’ll complain. You can order whatever phrase you want at http://www.myracecarsticker.com.au At the moment they come with a flag, but if there is enough demand I think BT could be convinced to do cancer awareness ribbons instead of the flags. When I sent this to Lisey she said she wanted one for her car, front door, back door, letterbox and pram. Well, there you have it. 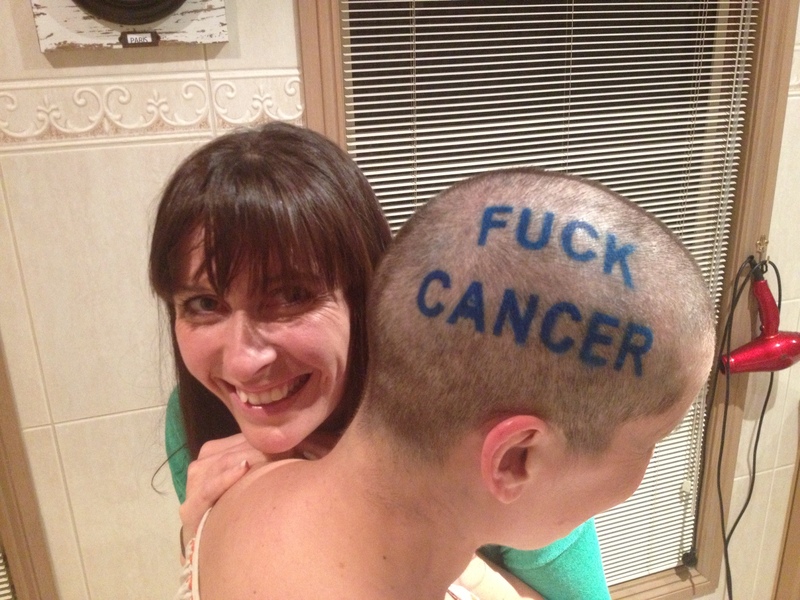 Twelve dodgy hodgy chemo cuts revealed and a plug for the brother-in-laws stickers at the same time. 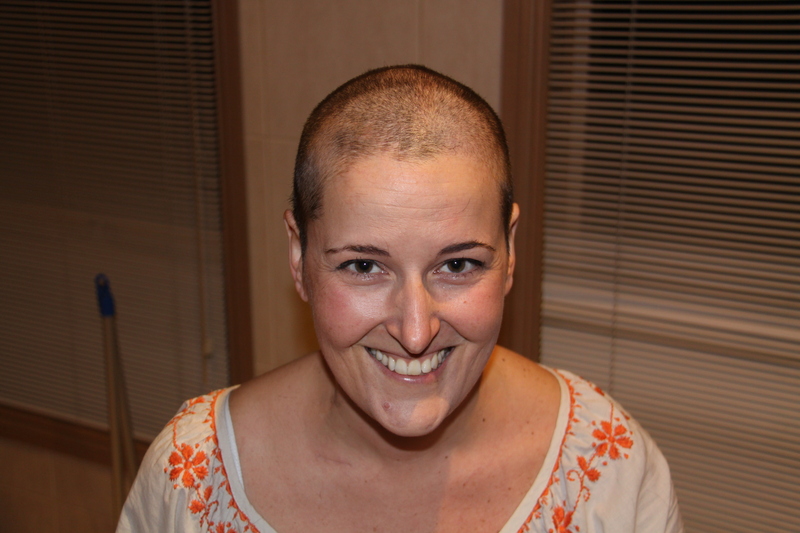 The next dodgy hodgy cut is not really a cut, it’s what happens after two months of chemo when some of your hair falls out and some of it actually grows. This is the one I am calling ‘The Ev’, after a very good friend of mine from high school. I’ll talk more about Ev when it’s revealed. So, Ev. The pressure is on. Time for you to either join the team or make a sizeable donation if you want a whole post dedicated to you. And since you’ll be torn between donating to either Lisey or myself, I suggest you walk! Please keep the donations coming. Although I have raised the $2000 required to walk, I am hoping to raise $5000. Pam still needs help to reach the walking target too, as do many of our team members. If you are planning to donate, but haven’t yet, what are you waiting for? Do it now. 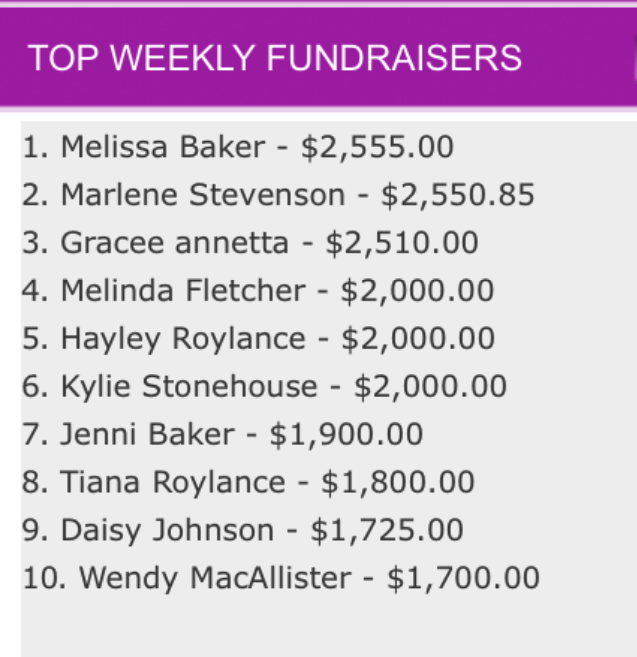 We are not far away from being in the top 10 fundraising teams and we are aiming for at least a top 3 finish. If you’re not planning to donate, change those plans right now please! If you want to join ‘The Good Tittie Team’, click on that ‘here’ button above, scroll down and click on ‘Join Team’. Let me know if you’re joining and I’ll give you the password. There were two members of ‘The Good Team’ at it’s inception only one week ago. We now have 15 and are one of the biggest teams walking! Many more are welcome, and there are rumours of several more members, including one from overseas!!! Is it wrong that I keep laughing at all your latest posts? Because I do and for a moment I forget the reason for you writing. And then I remember, and tear up! What a week of wonderful and generous donations. And each new recruit brings a smile to my face. Welcome funny cousin Chris. Some more humour to our team! And how nice for Leanne to join. I’m sure we can find Kermit. I have contacts. I’m sure she would love to walk with her 3 primary school friends in memory of her beautiful mum. And just to confirm, yes I did leave my bathroom like that for 3 days. I’ve started to live on the edge a little. I had a lot of fun doing number 12. It is my favourite too. And can everybody please order a sticker?!?! What a cutie you were and yes a tad woggy. Jen yes I’ll have a sticker please.